Nice attack: Who were the victims? 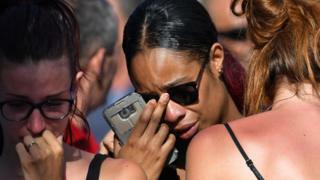 Children and adults, local residents and tourists were all among the dozens killed when a lorry ploughed into crowds on Nice's famous seafront Promenade des Anglais. Of the 86 who died, 10 were children and teenagers. A total of 303 people were taken to hospital following the attacks, the French health department said. Most of those who were killed died in the hours immediately after the attack. One man, 56-year-old Frenchman Pierre Hattermann, died on 4 August after failing to recover from his extensive injuries. His wife and son were killed in the attack and his 14-year-old daughter remains in hospital. The family were reported to be from the eastern Savoie region and in Nice on holiday. French officials announced on 19 August that another man had died of his injuries. They did not release his name but said that he left behind a wife and two children. Christophe Lion was the only survivor from a family group who had travelled to Nice from the French border area near Luxembourg, according to French media. His wife Veronique Lion, 55, and her 28-year-old son Michael Pellegrini, a professor of economics, were killed along with Veronique's parents Francois and Christiane Locatelli, aged 82 and 78, and Christophe's parents Gisele Lion, 63, and Germain Lion, 68. Paris tobacconist Timothe Fournier, 27, died protecting his heavily pregnant wife, Anais. She described how he pushed her out of the path of the lorry before being struck down himself. "He was a young dreamer, but he was always there for his wife and future child," she said. Fatima Charrihi, 60, a mother of seven, was also killed. Her son, Hamza, believes she was the first victim to die. "All I can say is she wore a veil and practised Islam in the proper way. A real Islam, not the terrorists' version," he said. Russian student Viktoria Savchenko, 20, was knocked down and killed while walking on the promenade with her friend Polina Serebryannikova. Both were students at Moscow's elite government-run Financial University, and the university issued a statement paying its condolences to her family and friends. Ms Serebryannikova was being treated in hospital for serious injuries. Robert Marchand, a 60-year-old industrial supervisor from Marcigny, a small, rural town in eastern France, was another of the French victims. He was also a parent and a coach at an athletics club. Thirty-nine-year-old Rachel Erbs had gone to the Promenade des Anglais to see the fireworks with her family, A sales assistant from Cessieu south-east of Lyon, she was heavily involved in her town's basketball club. She was with her husband and two children, aged six and 12, who survived. Aldjia Bouzaouit, 42, had gone with her family to watch the fireworks. Her sister said she had wanted to have an ice cream on the promenade. As the lorry came towards them, they scattered but Aldija was killed. Emmanuel Grout, 48, the deputy commissioner of the local border police, was off duty and watching the fireworks with his girlfriend and her daughter when he was killed, according to reports. The high-ranking officer oversaw police operations at Nice airport. Sisters Magdalena (21) and MarzenaChrzanowska (20), from a village in southern Poland, died while on holiday with their two sisters. Dorota and Gabriela survived the attack. Their mother died four years ago and the two women who died were described by a local priest as "remarkable". American tourists Sean Copeland, 51, and his 11-year-old son Brodie were also killed. In a statement, the family said: "We are heartbroken and in shock over the loss of Brodie Copeland, an amazing son and brother who lit up our lives, and Sean Copeland, a wonderful husband and father. They are so loved." Brodie was a member of a baseball team in Texas. The team posted a tribute on their Facebook page, saying: "Rest in peace, Brodie and Sean, you will be remembered by many." Another American victim was 20-year-old Nicolas Leslie, from San Diego. He was a student at the University of California in Berkeley and was taking part in a summer programme in Nice. His colleagues had put up posters with his photo across Nice in the hope that he would be found. Of the dead, 10 were children. The first to be identified was Yannis Coviaux, four, who was there with his parents and friends to watch the fireworks. AFP reported that a 12-year-old boy called Mehdi H. from France was killed, while his sister is in a coma and his aunt has also died. The editorial team of a magazine in France shared on Facebook that the daughter of one of the team had been killed. She was 12 years old and her name was Amie. Teenager Laura Borla died. Her relatives thanked all those who shared her image in an attempt to find her after the attack. "Thank you all for making the effort," they said. Laurence Tavet, 49, and her seven-year-old grandson Yanis were killed. Ms Tavet was at the Bastille Day celebrations with a second grandchild - it is not clear whether this child survived or not as separate agencies are making contradictory claims. David Bonnet, 44, a fish farmer is survived by his 21-year-old daughter. Three victims were from Switzerland, officials said. They included Linda Casanova Siccardi, 54, and a child. Mrs Siccardi had been on holiday with her French husband, who survived. Four Tunisians also died in the attack. They were Olfa Bent Souayah Khalfallah, 31, and her four-year-old son Killian Merji, along with Bilal Labaoui, 25, and a mechanic called Mohamed Ben Abdelkader Toukabri who was in his late 50s and had been living and working in France. Mino Razafitrimo, 31, from Madagascar died. Her children, aged four and six, survived. A friend said she was active in the Malagasy community in Nice. Belgian media (in French) reported that a 48-year-old father-of-four, Igor Chelechko, died. He was of Russian origin, had been living in Belgium and had moved to Nice just a few months ago. Nathalia Otto from Kazakhstan also died. She was in her fifties and had been living in Belgium. Roman Ekmaliyan, 56, was a Georgian of Armenian heritage who lived in Belgium. He was remembered as a "very intelligent" man, particularly interested in history and politics. Two Algerian children and a 70-year-old Algerian woman who was visiting her daughter in Nice were also killed, the country's foreign ministry's spokesman said. According to reports, the woman's name was Ferkous Zahia Rahmouni. A German teacher and two students, who were on a school trip from Berlin, were confirmed to be among the dead, the Berlin mayor's office said. Local media (in German) named the teacher as 29-year-old Saskia S., while the tabloid Bild (also in German) said the girls might be Silan and Selma, who are officially registered as missing. Armenia's Foreign Ministry has confirmed that one of its nationals was killed. A witness has told Public Radio of Armenia that the woman who died shielded her baby with her body. Ukraine's minister for foreign affairs confirmed in a tweet that one Ukrainian national died in the attack. Local media in Nice said two Moroccan people had died in the attack. A Facebook page called SOS Nice was set up to help people find their relatives and friends in the hours after the attack. The administrators of the page shared on Sunday that 14-year-old Laura Borla had died, but this was not confirmed by other media outlets. Despite the countless personal tragedies in the city, after several hours the page began to report that many of those reported missing had been found safe and well. Please note that French police have not identified publicly all victims, as they try to make sure they do not give out the wrong information about anyone. The BBC has compiled this information from press agencies and reports around the world as well as social media. We have made efforts to verify the information we publish but if you are concerned about a friend or relative, please call the official number: 0033 493 72 22 22.